Ministry projects announced for DfG’19! DfG runs for 14 weeks each spring – the first day of class in 2019 is Tues 26 Feb! DfG is accepting applications from students until 6 Feb – apply now! Finland is currently undergoing a profound digital transformation. The Ministry of Finance is preparing a national program for artificial intelligence (AI) at the same time as national information policy and a new Information Management Act are underway. Through such initiatives, significant growth in GDP and employment are projected. Goals for AI encompass and reach beyond growth, digital advancement and efficient administration of public services – the aim is to enable transformation toward a people-oriented and proactive society. Focus is on people’s real-life events such as milestones in education, family life, employment, etc. For people managing their life events, services should be provided seamlessly through AI across public organizations and businesses. AI would need ensure privacy, security and ethics while crossing boundaries of institutions and sectors, public and private, national and local. This project is a close collaboration with the ministry team and national network preparing and communicating the AI program for the coming 76th Government of Finland. Many companies view customer satisfaction as a competitive advantage. Achieving customer satisfaction means respecting laws, including those protecting against false advertising, safeguarding of minors, securing warranties and customer privacy. 2018 marked 40 years of the ‘Consumer Protection Act’ in Finland. However, a recent EU study reveals that familiarity with consumer law among businesses and consumers in Finland has declined, which can put consumer trust at risk. The task of the Finnish Competition and Consumer Authority (FCCA) is to provide instructions, advice and information on consumer law. A goal of FCCA is increase knowledge, interest and investment in consumer rights, from early on in product planning, design and sales through ongoing customer support, service and product disposal. The biggest challenge seems to be small to medium-sized businesses. This project investigates why this is and how to boost consumer rights among businesses. Can consumer satisfaction, including laws, ethics and rights, be the new competitive edge? Projects are the result of proposals made by Finnish ministries, refined with DfG teachers into “project”-sized briefs, which will be further focused and addressed within the course by students. These above are short descriptions of longer project briefs that cover questions framing the project including “Where are we now?”, “Who is the target group?”, “Where do we want to be?”, “How are we going to get there?” and “How will we know we’ve arrived?”. Hold the date for the Final Show 09:00-12:00 on Tues 21 May! 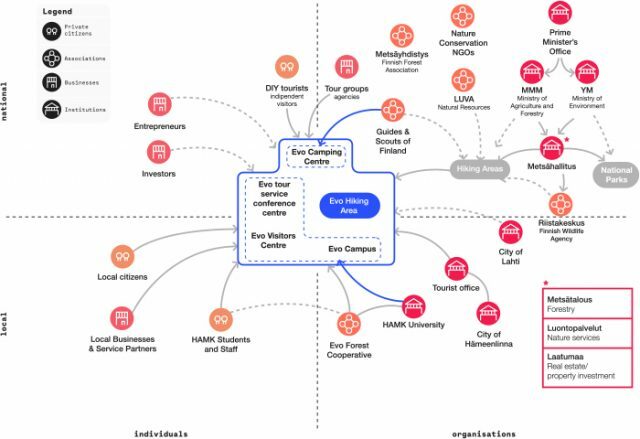 Image credit (top): A map of research insights from ‘ELEVATE: Re-organizing the Hiking Area process for civil servants‘, one of the DfG’18 proposals for the Ministry of Agriculture and Forestry and Metsähallitus by Andrea Gilly, Katariina Kantola, Hye Jin Jinny Kim and Ada Peiretti.